Online store is closed. All tickets must be purchased at the door. 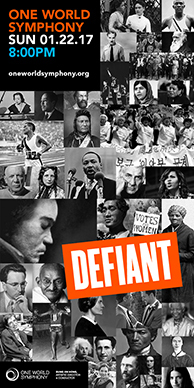 If you can successfully identify the subject of all 40 images on our Defiant poster, we’ll give you two tickets to the January 22 performance! Simply click on the poster to the right to enlarge, send us an email at defiant@oneworldsymphony.org by January 20 listing and correctly identifying — 1 through 40 — each of One World Symphony’s chosen Defiant ones, and we will award you with two tickets to Defiant on January 22, 2017. BONUS ROUND: If you can successfully identify the subject of all 40 images as outlined above AND briefly tell us what makes them Defiant, we will award you with two tickets to Defiant on January 22, 2017 AND two additional tickets to any upcoming One World Symphony program. • There are a couple of overlaps or duplicates. • One of the images represents a concept rather than an actual historical subject. Availability is limited. Limit one entry per person. Staff from Mount Sinai's Sexual Assault and Violence Intervention Program (SAVI) will be on-site at Defiant to discuss the vital nature of their work and their role in serving the survivors of sexual assault in our local community. SAVI provides immediate crisis intervention, follow-up counseling to survivors and their families, as well as educational services to public and professional communities on the issues of sexual and domestic violence. The approximate length of the program will be 80 minutes without intermission. Sunday, January 22, 2017 at 8:00 p.m.